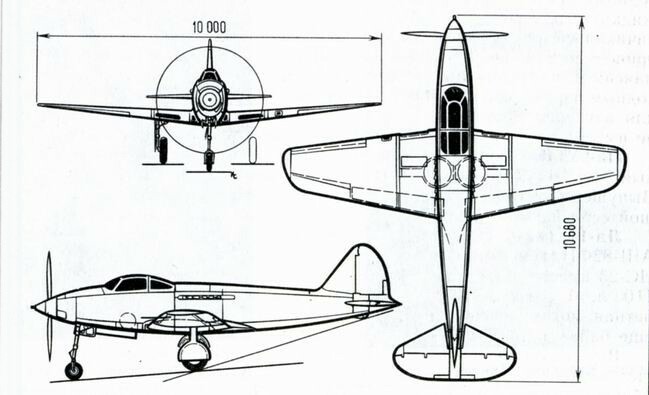 The Gu-1 single-seat fighter designed by Mikhail Gudkov had a liquid-cooled engine installed aft of the pilot's cockpit, close to the CG, and driving the propeller via an extension shaft and reduction gear. 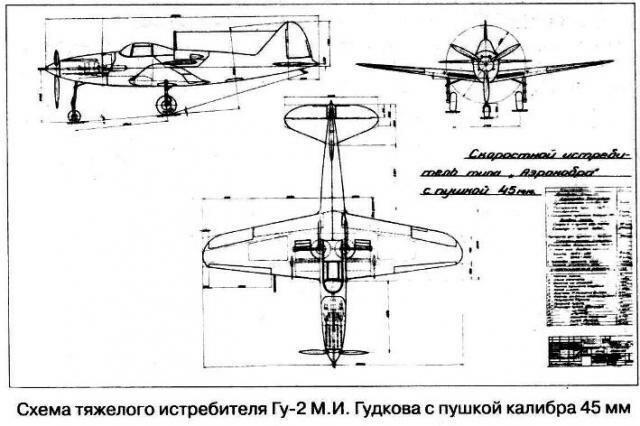 Design of the Gu-1 was commenced in 1940, and the fighter was of mixed construction, with welded steel-tube forward and centre fuselage covered by duralumin skinning and metal wing mainspars, the remainder of the airframe being of wood. Power was provided by a Mikulin AM-41 12-cylinder liquid-cooled engine, the main coolant radiators for which were buried in the wings. The Mikulin bureau experienced difficulties with the extension shaft and reduction gear which were not ready for testing until 1942. Armament comprised a single 37-mm Taubin cannon firing through the propeller shaft. In the event, the Gu-1 proved to be seriously overweight. The initial flight test was performed by A I Nikashin on 12 July 1943, but after reaching some 650 ft (200 m), the fighter dived into the ground, killing the pilot, and further development of the Gu-1 was abandoned. No illustrations of the Gu-1 appear to have survived and the only available data are the weights. Empty weight, 8,249 lb (3 742 kg). Loaded weight, 10, 163 lb (4610 kg).